Extremely light, express foam conditioner for hair without volume. Specially developed rich formula, with carefully selected active ingredients in high concentrations –natural linden flowers and horsetail extract, collagen, fluid keratin and inutec – instantly improves condition and appearance of the hair, providing it with greater volume, without weighing it down. 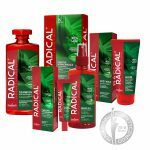 Through regular use, Radical® conditioner visibly strengthens the hair, improves elasticity and dynamics and lifts it at the base, adding volume. Apply a small quantity of foam on washed hair, and gently massage from roots to hair ends. Do not rinse. Then comb and make the hair. Linden flowers extract, horsetail extract, collagen, keratin, inutec.